Well, another holiday is history. It's amazing how much work and preparation goes into Christmas and it's over before you know it. Once again, I did the turkey dinner and I didn't forget anything with dinner. I did, however, forget to put out one appetizer. There is SO MUCH food left over! We'll be eating this for days. Of course, there's broth cooling on the stove that will probably be soup within a couple of days. I think I'll get some soup ready for Kelly tomorrow. She wasn't feeling well today, she felt like she had the flu. She wound up spending the evening sleeping in Kim's room. So, she didn't really get to enjoy dinner at all, poor thing. 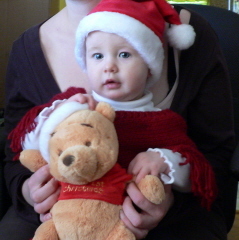 Nothing makes Christmas fun like a cute baby. Lorelai was the life of the party. In this picture, I finally caught the cute smile she's recently developed. She crawled all over the living room, enjoying her new toys and the bows. The bows were a big hit. I'll have to get Kim's pictures. She has pictures of Lorelai with bows on her clothes, in her hair. Yesterday, we kept replacing the bows she kept pulling off the gifts. Today, she was free to play with all the bows she wanted. 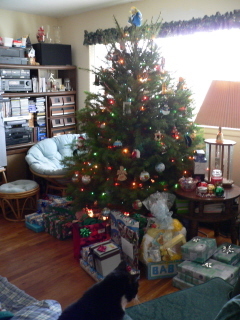 Here's the living room before we attacked the gifts. I must have been a good girl this year. Santa was very good to me once again. I have some lovely things and some funny things, like this gift from Kim. 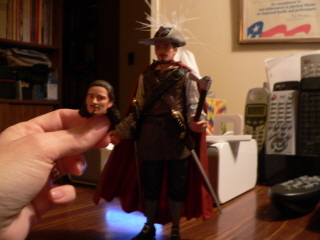 Yes, that is a Will Turner action figure. Kim said it was worth the look on my face when I opened it. I just cracked up. The last couple of years, Kim and Kelly have given me an Orlando Bloom calendar. Kim couldn't find one this year but thought this would be a great substitute. 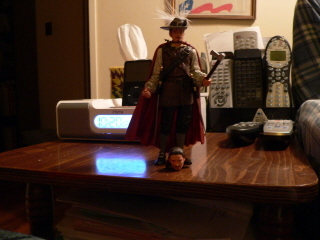 The funniest thing about it is it has an "alternate head". It actually says that on the package. It's an "alternate head". The expression on the face (which I must say doesn't look much like Orlando Bloom - more like a computer generated Orlando Bloom) isn't much different but the hair is in a ponytail on one head and just down on the shoulders on the other. It's so funny. Kim and I had fun playing with him after dinner. I just love the feathers on the hat. In the next picture, you can see another gift I got that's so cool. It's a unit to play my iPod. I thought it was just speakers but it's an alarm clock and a radio as well. It's fun and it charges the iPod while it's playing, which is convenient. Sue and I will be interpreting Nuncrackers on Thursday, which is scary since I haven't even read the script yet. I did see the show and Sue and I divided the parts. I just have to work on it. Hopefully, I'll have time tomorrow but if Kelly's still sick, I'll have to take Lorelai here and that will cut down on studying time. Yikes. Well, I'd better go finish my soup. And did I mention we have tons of food leftover? I won't have to cook for a week. Not a bad deal. You cook one day and eat it all week. Yes, it is the first day of winter and there are birds chirping outside my window. Weird. Meanwhile, in Denver, they're in the midst of a blizzard that's closing the airport. The weather's been bizarre. I think the forecast for Christmas Day is sunny and in the 50's. Baking is on the agenda today. I have completed Lorelai's stocking for Nana's house. It's hard to tell from the picture but it's big. I checked the dimensions and they're correct. It's supposed to be that big. I didn't even bother looking at that when I first saw the pattern. I just said, "Oooh, nice" and proceeded to start it. It looks really nice, though. I love gansey kitting and the patterns look great. 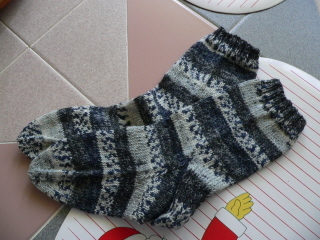 I also finished the mock fair isle socks. They're not blocked yet but they're complete. For anyone keeping score (and I can't imagine anyone except myself doing that), this is four out of the five complete. 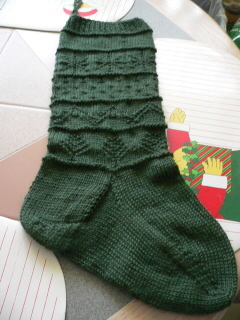 I hope to finish the last sock before the end of the year. After that, I have some other ideas and a couple of sweaters begun. I really don't have much started. It looks like a lot but it's not an overwhelming amount of work for the new year. Kelly and Mike haven't been feeling well so I was babysitting Lorelai yesterday and will have her this afternoon when they go to the doctor. I hope they're better before the weekend. It stinks to be sick on Christmas. Lorelai seems fine, although she's still cutting a front tooth and has been a little ornery because of that. I made Lorelai's Christmas dress on Monday but didn't take a picture before Kelly brought it home. Of course, there will be pictures of her wearing it so it doesn't matter. The kitchen calls along with with Christmas carols. Ta-ta, all! No matter how much time you have to get things ready, you still feel overwhelmed by the holiday preparations. At least, I do. I'm definitely on track but I've still felt like I was getting things done just under the wire. I really need to take a deep breath and.... well, breathe. I do love them. They are quite cute. Kelly and I took Lorelai to Theatre Three in Port Jefferson today to see Dennis and Chadd in a children's Christmas show called Barnaby Saves Christmas. It was very cute. Lorelai watched some of it and spent some of the time in the lobby crawling around on the carpet. 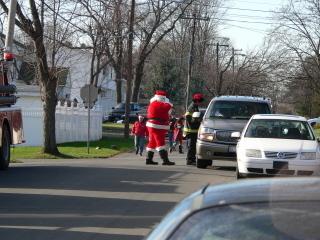 After the show, kids were invited to have their picture taken with "Santa" (Dennis). Kelly was waiting to see what Lorelai would do when she heard Dennis' voice come out of Santa. Turns out she was quite befuddled. 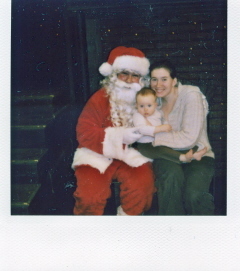 It's a little hard to see in the poloroid picture but that's Lorelai's befuddled face. After all the children had left the theatre and we were in the dressing room, Dennis took off the costume and Lorelai smiled at him. Ok, that's the guy she knew! Still, this is better than Kelly's first Santa picture, where she had her mouth wide open, screaming her head off on Santa's lap. That situation had no where to go but up! 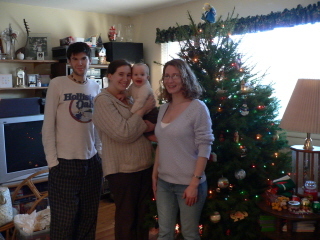 Later in the day, we trimmed the tree. 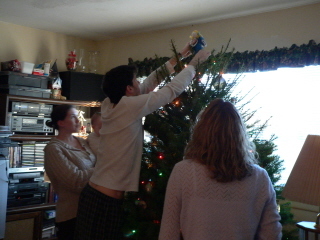 The decorated tree needed the last touch, the dopey crocheted angel. We thought it would be nice if Kelly and Lorelai put the angel on the tree but they were a bit too short, even though this tree isn't all that tall. They needed Uncle Billy's help. The tree isn't too wide. It fit in our limited space just fine. 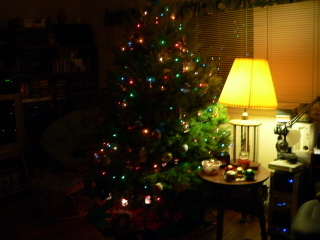 I do have pictures with flash but you can't see the lights on the tree. I like this artsy, shadowy, natural light picture. I'll take another one in day light. That will give more detail. Celebrating a job well done. I'm still working on the stocking Lorelai will have at Nana's house. 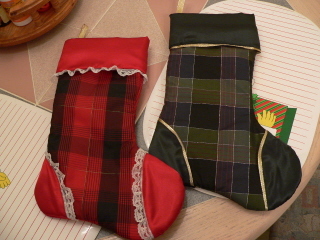 It's a gansey style stocking. I knitted her name in the first panel under the ribbing but you really can't read it. Maybe when there's something in the stocking and it's stretched out, it will be readable. However, the designs show up much better. I'm up to the heel so it should be done soon. I'll definitely have it done before the holiday. 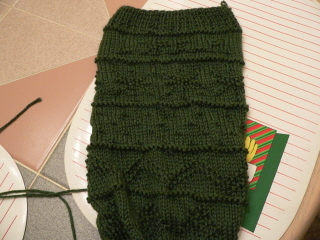 After this is done, I have about two inches to do on the second mock fair isle sock and I can do the toe. Then, I'll have one more sock to finish of the original five. I also have one sock completed with a really pretty yarn I got from ebay and I recently got some hand dyed yarn from Hello yarn to continue the sock obsession. Last, but certainly not least, I'd like to pass along a little information from Stephanie Pearl-McPhee (aka The The Yarn Harlot) about her challenge to raise funds for Doctor's Without Borders. Stephanie is asking knitters to show how much they care and to contribute whatever they can. Now, I know I don't have the readership Ms. Harlot has. Let's face it. I'm thankful to see two or three hits a day and I still only have 23 entries in my guest book and two of those are from me and Brad and Dave from Bravenet (gotta love Brad and Dave - they gave me a free guestbook). Nevertheless, I'd like to do my part to help keep the information moving to knitters who may be lurking out there in my meager readership. So, if you'd like to make a contribution, please visit Stephanie's blog. 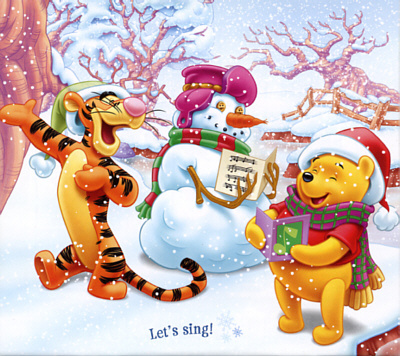 TTFN, countdown to Christmas....nine days! Santa visited West Babylon today with his firefighter friends and since Kelly saw them before she left for work, she waited until Santa came by before going to work. Just as Santa was coming down our street, this is how Lorelai looked. She was fast asleep. But the fire engine's siren woke her up. 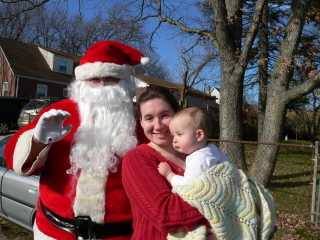 So far, Lorelai has been to the firehouse to pick out the tree and had a visit with Santa as he toured our neighborhood. I'm glad Santa came around today since Kelly, Bill and I went to the city yesterday to see the play The Apple Tree at Studio 54. Kristen Chenoweth stars with Brian D'Arcy James and Marc Kudisch. This sounds rather awkward since Chenoweth and Kudisch were once engaged. Interesting that they're working together. It was really good, very funny. Adorable, actually. Warm socks and Christmas angel, etc. Here's our little Christmas angel, ready for the holiday. 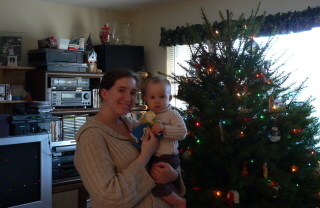 This is Kelly and Mike's (and Lorelai's) Christmas card picture. Kelly and I did the photography session on Tuesday afternoon. When we chose the picture, we uploaded it to Snapfish.com and she ordered her cards. They arrived yesterday. Technology is quite amazing these days. Speaking of technology, I can't help but mention the passing of James Kim. James, his wife, Kati, and their two daughters, ages four and seven months, were missing in a remote region of Oregon from November 25. They had been returning home to San Francisco after visiting family in Seattle for the Thanksgiving holiday. They took a wrong turn, got stuck in the snow on a road rarely traveled during the winter months (a road which is not plowed), and were missing for over a week before Kati and the children were found by helicopter. Several things led to their rescue. Family members had hired helicopters to search, text messages sent to their cell phones were not received but their phones were responding, giving searchers an area of about a 26 mile radius to focus on and one local man had a hunch that they had taken this particular road. They were found where he thought they would be. Unfortunately, two days before their rescue, James set out on foot to try to get help. Although searchers could follow his tracks, he ultimately was found dead of hypothermia. Living with two tech geeks, we watched shows on TechTV before G4 took over the network and turned it into mostly gaming and less computer tech. I remember watching James. He was a reviewer of new products and had a very gentle way about him. We watched these shows so long, the hosts and contributors almost felt like family. I've followed the growth of Megan Morrone's children on her website. Bill still watches Leo Laporte on his internet show, as well as Robert Heron and Patrick Norton on their show, DLTV. So, we followed this story from the first day and I couldn't get these people out of my mind. I'm thankful that his wife and children are safe but so sad that they have lost their husband and father. It's ironic that someone so intelligent, who had so much technical knowledge, would be at the mercy of the elements like that. We think in this modern day that all our technological advances would save us in any emergency situation. I wish this story had had a different outcome. It's so cold this morning and by Sunday, I think it's supposed to be back in the 50's. I dropped my car off for scheduled maintenance this morning and made good use of those warm wool/fleece mittens and the cable socks, which I finished a little while ago. I can't remember when I finished them, it might have been a couple of weeks ago. I'm proud of them and they really are warm. They are quite pretty as well. I was working the last couple of days, substituting at two schools in Smithtown. I was a little stressed about having to work since I'm in the midst of the holiday preparations and having all this time is so nice. However, a little extra money is also welcome this time of year. My shopping is done, though. Cleaning, decorating and baking are still to be done. Though today feels like the holiday season, the warmer temperatures were really nice. 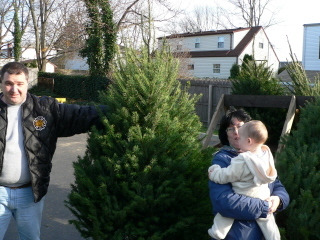 Grandpa and Nana took Lorelai to the firehouse today to choose the "Honig Family Christmas tree". She looks thrilled, doesn't she? Give her a few years. This will be very exciting one day. This is the tree we chose. It has a really nice shape. I hope it's not too wide. It's always difficult to tell. Still, it's not too tall so it shouldn't look overwhelming. Lorelai looks on approvingly. We'll probably decorate it about mid-month. Stay tuned. Last night, Kelly (with Lorelai in her lap), Billy and I were sitting around the table. Lorelai was playing with a blue plastic Solo cup, one of her favorite playthings. Billy handed her a crumpled up napkin. He's always encouraging her to throw things. She looks at him like, huh? 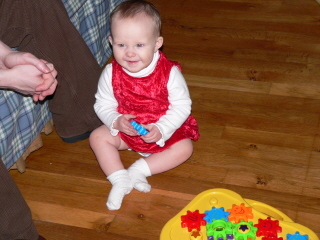 As Lorelai was playing, Kelly mentioned that she didn't realize, until she'd read the baby books, that putting an object into something and taking it out are two entirely different skills and that she should be able to put something into something around the age of 14 months. I said I didn't know that, either. Immediately after this exchange, Lorelai put the crumpled napkin in the cup and took it out again. She proceeded to repeat this action several times while we watched her. For the record, she just turned 10 months. Leave it to Lorelai to prove the baby books wrong. It was as if she was saying, "Oh, yeah? Well, look what I can do." 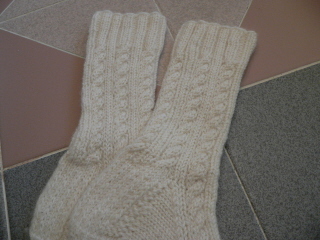 I finished the cable knit socks and one of the socks with the pretty cocoa rose yarn from ebay. I don't have pictures yet but I'll try to remember to do that tomorrow. I'm loving the cable knit socks. Very warm and cozy. Now that the weather is seasonable, I'm able to wear my socks. In fact, I'm wearing the socks pictured above (finished objects) right now. Don't hate me but I'm one gift away from finishing my Christmas shopping. I plan to pick up the last gift tomorrow and I will mail gifts and cards next week. I hope to wrap everything next week as well. Today's shopping trip involved buying Lorelai's new car seat. She's outgrown the infant carrier seat. We picked out this one for Kelly's car and another for my car. It's Lorelai's Christmas gift, really, but she needs it now. She'll have toys under the tree. Three more asl classes and I'm finished for this semester. More time to prepare for the holiday. December is upon us again, although you wouldn't know it from our recent weather. It's been so mild, it has seemed more like spring than fall. Now that December is here, it seems the weather is in for a change. It's quite rainy today, which will apparently bring in some more seasonable weather. I'm not thrilled with cold weather but at least I'll be able to wear all these socks I've been knitting. And it will feel more like the holiday season. However, once the holidays are over, I'll be voting for warm weather to return asap. Last weekend, we visited the Steinheimers in Maryland. 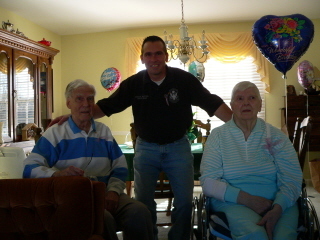 Aunt Ruth and Uncle Joe celebrated their 90th birthdays. The party was a surprise in that they didn't know anyone was coming until we all started arriving. It was nice, a lovely day with family and fun. 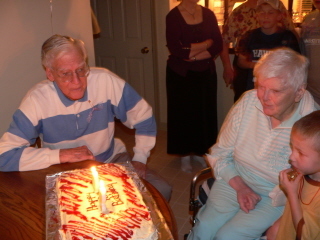 Ah, they didn't have to blow out 90 candles! I guess it would have been difficult to light so many candles. 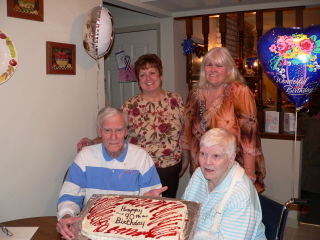 Mary and Lyn with Aunt Ruth and Uncle Joe. We were concerned about the traffic, since it was the end of the Thanksgiving weekend. We left early Saturday morning and only hit a small snag where there was an accident. Mapquest said it would take 4 hrs, 48 minutes to arrive at the hotel. With one brief stop, we got there in 4 hrs, 50 minutes. Amazing. Even more amazing was the trip home Sunday morning. We left the hotel around 6:30 and were home by 10:30. Watching the news later, you could see that leaving early was the best thing we could have done. Traffic was a mess later in the afternoon/evening.